Yinon at Tzadok movers was a pleasure to work with. He came to give a quote promptly and his professional manner eased many of my anxieties of moving. On moving day, he arrived early with four wonderful workers who did a fabulous job... They worked efficiently, professionally and cheerfully. I can heartedly recommend this company. 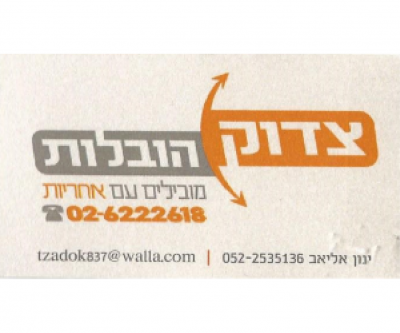 I am very pleased with the professional transportation services of Tzadok Movers Ltd. These are young and serious guys. They come and tick the work without too much talk and most of all are at the agreed price and do not find any excuses to get you more money. I came to them via the Internet, read excellent opinions, realized that they are engaged in professional transport and full of house contents and called to get a quote. They gave me a really fair and realistic price quote for everyone I talked to. In short I was very pleased and it turns out that there are more fair people in the world - strongly recommend! I needed two truckloads, one of an apartment inside Jerusalem that included crane services and the other a number of furniture from Ramat Hasharon to Jerusalem, and I looked for a reliable and professional professional to do the job. 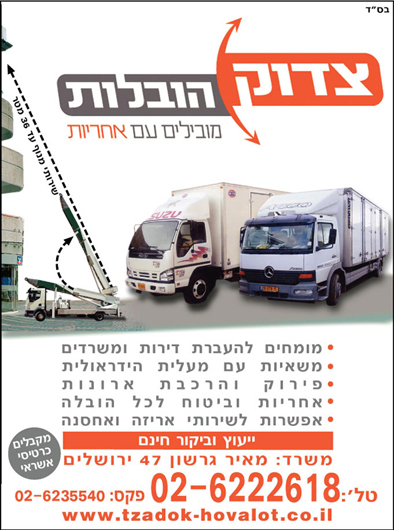 After searching, inquiries and market research I came to Yinon from "Tzadok Movers Ltd." which justifies the words reliable and professional. The communication with Yinon was immediate, it was available both in terms of the phone call and the performance of the work. They arrived at the time and time we set and began to carry out work and transportation. Everything was done smoothly and very professionally. All the equipment was intact and as it was before the transport, the work was very efficient and quick. I ordered Yinon from Zadok Movers Ltd. to transport an apartment, including packing all my possessions, inside Jerusalem. This is a professional, courteous and very nice team. They arrived at the time we set and began to pack everything. At the end they carried out the transfer with care and emphasis on fragile objects. They carried out the transfer quickly without dragging too long, and unloaded all the objects in the new apartment in an exceptional manner. The whole service is commendable, the price was very fair and I am very pleased with the experience and service I received. I highly recommend the nice guys.